I’m coming off a show week: four nights and days of rehearsal, a night off, then a dress rehearsal, a Friday show, and two Saturday shows. As any part-time performer will tell you, show week is grueling: you work your 9-5, grab some food quick in the car on the way to the venue, and then put in another 4 or 5 hours of evening rehearsal before going home to crash and get back up again. And yet, despite the late hour we get out of rehearsal, I know that I am not alone in going out for a bite afterward: rehearsing is hungry work, and personally when I’ve been dancing I want — nay, need — fried things. And so we performers often adjourn to some late-night dive that specializes in dropping frozen foods in a fryer. (Hey: we can’t always be doing blog-worthy food, ok?) But what about after the show’s closed? What about Sunday, when you’ve slept for twelve hours and are starting to feel all the achey joints from where you landed badly, the scratchy throat from not holding back on that last round of a feature solo? When your husband nonchalantly describes your weekend as “doing three shows in 26 hours,” which is a truly horrifying way to phrase it? You don’t want just fried things, you want fried things with a comfort score of 11. In my case, I want Mr. W’s campout potatoes. Storytime! I was in the Boy Scouts all throughout childhood, joining as a Tiger Cub in first grade and going all the way through Eagle Scout my senior year. Troop 100 went camping once a month, every month, and for the most part we boys cooked for ourselves. We were, let us say, not great. Like, we could bang out some spaghetti with canned sauce, or some breakfast burritos with scrambled eggs and sausage, but it was just serviceable food: calories to survive. Over at the leader’s campsite though, was a whole different story. Somebody might bring in some fresh venison; or Dad would make one of his famous Dutch oven cobblers; or even one memorable time Mr. F brought in a whole bunch of dove he’d shot, wrapped each little gamey morsel around a sliver of jalapeño, wrapped that in bacon, and then grilled skewers full of them. And we boys got none of it, unless they were just full to the gills and we could beg the leftovers. “If you want better food,” they’d tell us, “you need to learn to make better food.” (I realize this sounds heartless, but it really wasn’t: they’d’ve happily taught us, but we were more interested in eating our bland spaghetti and then going back to reviewing whatever D&D manual somebody had brought along.) But the thing we could usually snag a bite of was Mr. W’s potatoes, because the man cooked like he was expecting a full battalion to arrive at mess any moment. And what a treat they were: soft, fried potatoes, salty and rich with pork fat, peppery and chile-inflected, but mostly just damn good. Because I was too busy learning about how psionics could function in a character creation, I never did actually learn how to make those potatoes, but years of trial and error got me to the right place. It took a number of false starts, because I kept overcomplicating it. 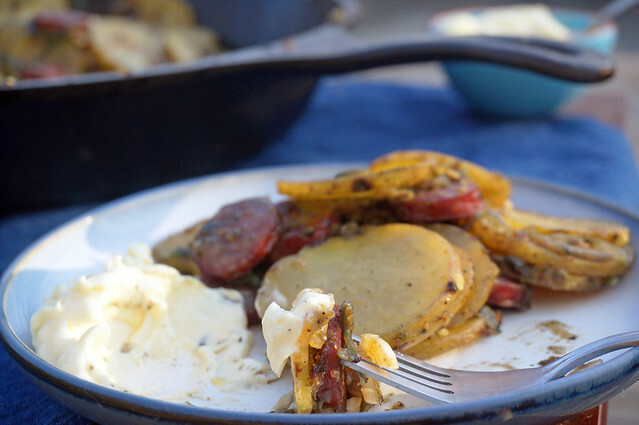 Mr. W’s potatoes were a marvel of rich flavors, but it turns out they’re one of the easiest things to make, though you wouldn’t know it from the taste. The long, slow cooking lightly caramelizes the onion and jalapeño, so the flavor is misleadingly deep and complex; even the black pepper starts playing out sweet notes you usually forget are hiding under its bite. 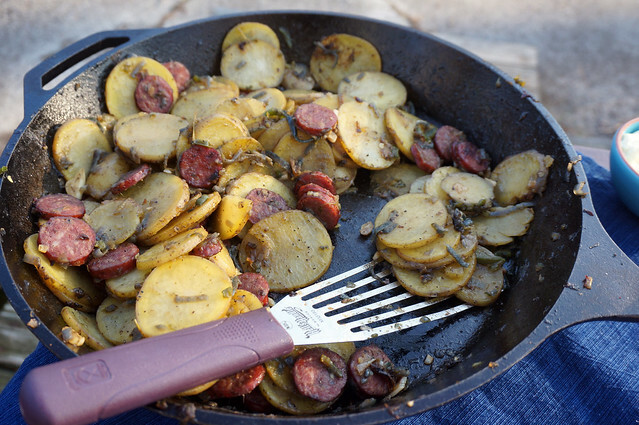 My homage to the fabulous potatoes one of my scout leaders cooked on most campouts. We boys never really got to eat the good food the leaders cooked, but now I can make these spicy, salty fried potatoes any time I want. They’re a great example of simple food done entirely right. Place the largest heavy skillet you have over medium-high heat. 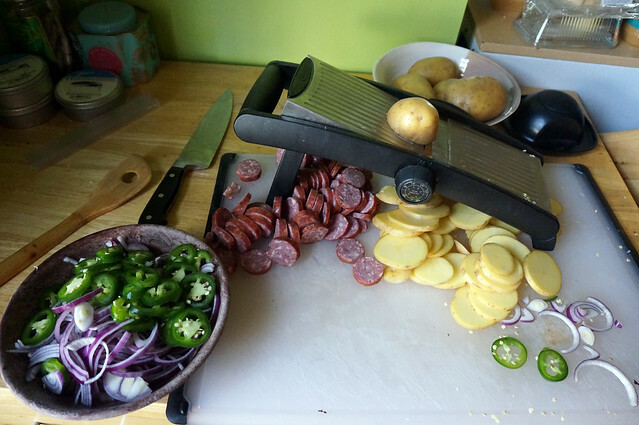 (I used a high-sided 14″ cast iron frying pan.) 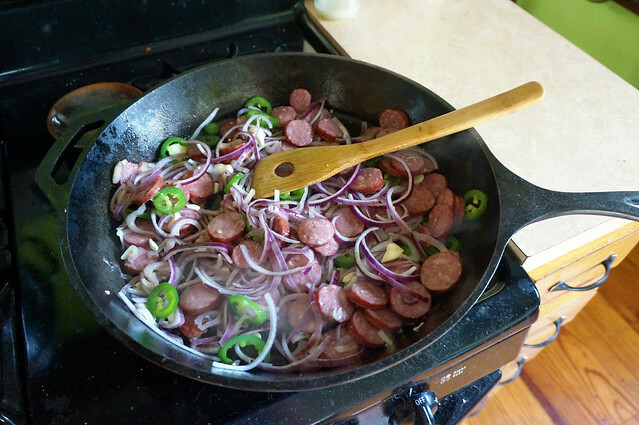 Fry the onions, jalapeños, garlic, and sausage in the vegetable oil for five minutes or till wilted. Add the potatoes, salt, and pepper, and reduce heat to low. (If you’re unsure about the amount of salt, go easy; you can always add more, but you can’t take it back out.) 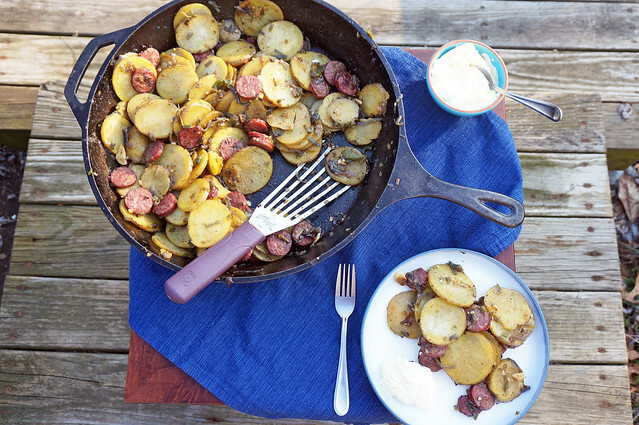 Toss the potatoes to coat them in the cooking fat and cook until tender, around 30 minutes. Every so often, toss the potatoes, nudging them a bit to separate them when they stick together. You’ll be able to tell if there are any potatoes that need special attention, because they’ll still be opaque while their panmates are turning translucent as they cook; just break them apart if they’re stuck together, and move them toward the bottom of the pan. How often to stir? Weeeeell. You definitely shouldn’t walk away and ignore them entirely: even if they don’t burn, the cooking will be very uneven. But they need some time to rest in the heat of the pan, too. I just putter around cleaning or doing other kitchen tasks while they cook, tossing when it occurs to me that it’s been a while. So, probably every 3-4 minutes. 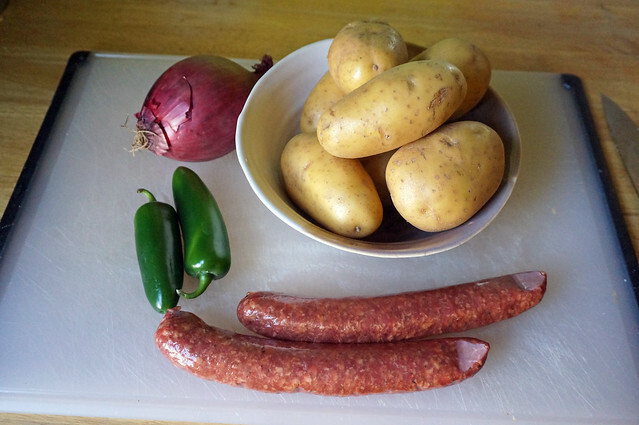 I often leave out the sausage when I don’t have any around, and the potatoes are none the worse — you might need a touch more oil, but other than that proceed as usual. You could vary the spicing here; think Tex-Mex, think fajitas. Chili powder, cumin, oregano, anything like that would be nice. You could even add some cilantro, though I’d wait till everything’s done and then stir it in off heat. This is a really huge recipe, and you honestly might not have a big enough pan. No harm in halving.